This is the second post of Disney Lessons on my blog, and this time I'm gonna talk about that little mouse from Ratatouille. Yup, Remy! For you who don't watch this movie, Ratatouille is a Disney movie about a little mouse, Remy, who's expert in cooking, and he secretly helps a chef named Linguini who can't cook at all. For some people who watch it, maybe this movie is funny because it's about a mouse that helps a chef to cook just by hiding in the chef's hat and controlling what he does with his hair. But this movie becomes very inspirational when you see it from this mouse's perspective. His name is Remy. His passion is in cooking. 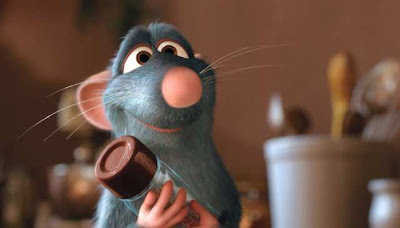 The most inspiring thing about Remy is, nobody supports him to cook. Everybody disagrees with him, even his father really hates him for doing that. But, it's about passion. His heart is in cooking. But then, back to the fact again: he's a mouse! How to be a chef when you're a mouse? By the way, I like how Disney Pixar choose a mouse for the animal in this story. A mouse is an image of dirtiness, and cooking is a job with an image of cleanliness. Super contrast. It's like to show how impossible it is for Remy to be a chef. He should do something else! Cooking is not for a mouse! The thing is, all the circumstances are against him. Nobody supports him. Nothing gives him a reason that he should do cooking. But what I like about Remy is, he keeps following his heart. He believes in his passion and what he think is right for him. He loves cooking, and when he believes it's what he should do, he doesn't give up no matter how many people disagree, or how hard the circumstances and all things around him try to stop him. Can't you have that kind of passion? It needs a courage. For most of us, it's easy to follow our hearts and go for what we want when everything is smooth with no barrier. However, when the situation and circumstances are not on our sides, we're like "Ah, it's so hard. Why don't I just flow with the circumstances and do something easier?" The problem is, sometimes people believe in their hearts, but then when there's nothing supports them, they give up. They're not willing to give more efforts to make it happen. They doubt themselves, then they move to something else because it's easier. Some people do because they think they have to do. Some people do because they have passions. That's what differentiates the result. What we can learn from Remy is, always believe in your heart. There's always people out there who disagree with you, try to stop you, and tell you that you're on the wrong track. There's always a reason that will tell you to give up because it's not worth it. But the most important is, your heart and your passion are things that know yourself best. If you think it's right for you, and if you believe this is the thing you should go for, just go for it. Chase it no matter how many things in front of you try to stop you, because what I believe is, if you follow your passion and your heart, you'll succeed. It's not always easy, but it's always right. wow, what an inspiring review :] i couldn't agree more with that !!! Hi Giscard. Iya nih, I was busy for these last months. But I'm back to blog again now! hahaha. hi, wilson. i'm so glad to read your blog, i have a problem, i dont like a major what i do now. so, what must i do? pretending to love it or what? hi, wilson. i'm so glad to read your blog, i have a problem, i dont like a major what i do now. so, what must i do?